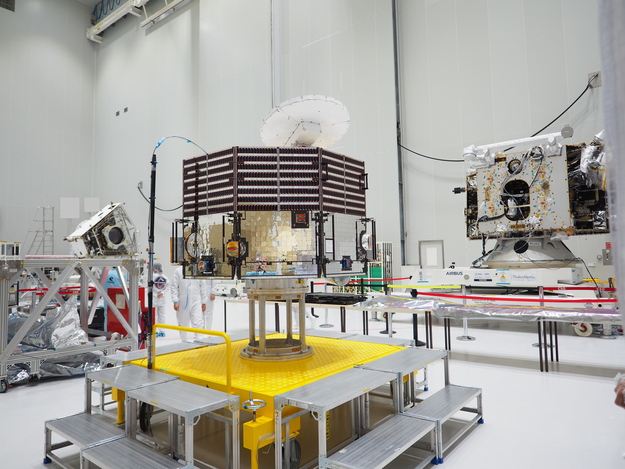 The three modules of the ESA-JAXA BepiColombo mission to Mercury are pictured here on 8 May, shortly after being unpacked at Europe's Spaceport in Kourou, French Guiana. Centre stage is the eight-sided Japanese module, the Mercury Magnetospheric Orbiter (MMO), with its white high-gain antenna seen at the top of the module, tilted upward; the antenna will be used to communicate with ground-stations on Earth. To the right is ESA's Mercury Planetary Orbiter (MPO) – currently without its protective insulation blankets. Together the two science orbiters will conduct the most detailed scientific investigation of Mercury and its environment than ever before achieved. The two orbiters will be carried to the innermost planet by the Mercury Transfer Module (MTM), which can be seen in the background to the left. The solar arrays that will provide solar power to the spacecraft will be attached later. Following the unpacking of the spacecraft at the Spaceport, each module was examined thoroughly to check that they did not suffer any damage during the transport from Europe to South America, and that everything remains aligned and functioning correctly. Individual units on the MPO and MTM – such as batteries and a power unit – have also been inspected and added to the spacecraft. The two modules were also connected with cables for electrical checks ­– they will be mechanically attached closer to launch later this year.